Onkelos (35CE-120CE) was a prominent Roman nobleman, a nephew of the Roman emperor Titus. The Roman Emperor, advised Onkelos to go out and find something that wasn't worth much today but would be invaluable in the future. Onkelos found Judaism and subsequently converted. He went onto become a notable Sage. Onkelos is responsible for Targum Onkelos תרגום אונקלוס‎, which is the official eastern (Babylonian) targum (Aramaic translation) of the Torah. The Roman Emperor felt that his conversion was an insult, so he sent soldiers to arrest the young man. However, before they could seize him, Onkelos taught the men about HaShem, and they converted to Judaism. The Emperor sent a second troop of soldiers to capture Onkelos. As they were bringing him back to Rome, he asked, "Can I speak with you about something besides religion?" The soldiers agreed and listened to his words. Onkelos went from subject to subject, until finally he began to discuss the concept of One Elohim. The second group of soldiers, too, became converts. Furious, the Emperor sent a third group of soldiers. This time, he ordered them, "Do not talk with Onkelos at all!" They obeyed. As they were taking Onkelos out of his house, however, he touched the Mezuzah and smiled. "Why are you smiling?" a guard asked. Onkelos replied, "Usually a king stays inside his palace, and his guards stand outside. But the Mezuzah teaches us that Adonai Himself stands outside guarding our homes, while we sit inside." The men were so impressed that they converted, too! A Jewish Prayer book is often called a siddur. But to say ‘prayer book’ in Hebrew is Sefer Tefillah. (In Leviticus 24:6 where it discusses the arrangement of showbread it uses the word maarechet מערכת meaning ‘row,’ or ‘battle line’. 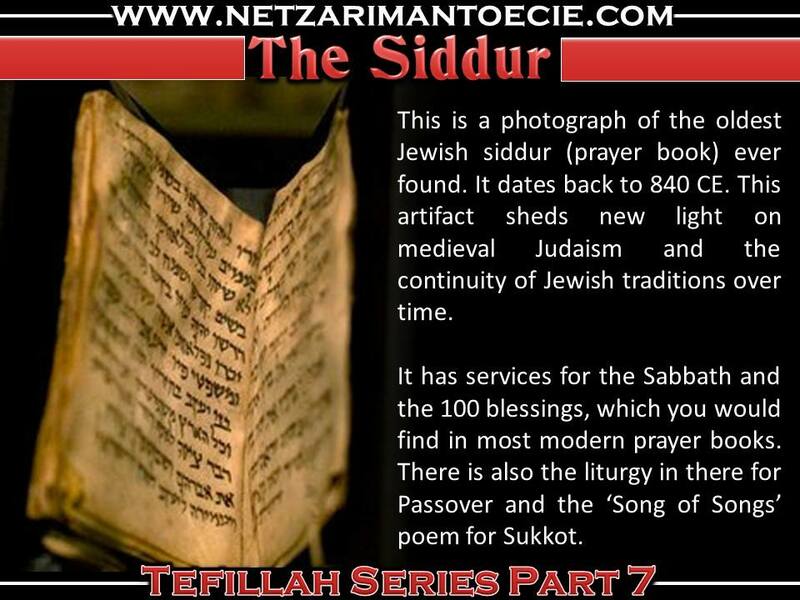 Siddur is related to the Hebrew word שדרה - sdera - also meaning "row" as in 2 Kings 11:8 which means ‘a row of soldiers.’ In Modern Hebrew it also means ‘boulevard, avenue’ and Sderot שדרות is a town in Southern Israel famous for being attacked by Kassam rockets. It got its name from the rows of trees planted there at the founding of the State. The Siddur is perfectly described in all these citations as in it being a backbone to formal prayer. The Siddur is not to replace inspired, conversational or situational prayer, but rather it is a guide line for addressing the King of Kings by bringing to mind every general need in a given encounter in an acceptable order. Even in general conversation with a benefactor, we begin the discussion with greetings and general inquiries into the benefactor’s own wellbeing and lead into thanks for his current provision before requesting additional support. The role of a siddur is to affirm a person’s role and worth in relationship with a holy community and with a Holy Elohim through Yahshua HaMoshiach. Every relationship requires action and the siddur reinforces how we should behave. Tefillah approached with the backbone of a siddur is not simply a matter of personal transformation or reflection; it is meant to assist us in moving us toward something greater. The siddur is not just to reflect who we are, but who we might become. Nevertheless, it is a tool that can be misused in that tackling its recitations with empty or double-minded thoughts can do us more harm than good. In its best state a siddur will underpin your prayer with a coherent framework and guard against a hodgepodge of blindly wielded emotional lunges at the Almighty. In Biblical times, books had not yet been invented so there is no example anywhere in Scripture of the use of a siddur. In actual fact, siddurs came into circulation much later. In early times the capacity of memory recall was significantly greater than what it generally is today. The Torah was originally taught 100% orally to the student and an advanced student was said to be considered wicked if he reviewed a given subject 100 times and righteous if he reviewed a subject 101 times. No doubt reviewing a new piece of Torah knowledge 101 times would cement it fairly firmly in the mind. Today, in our current generation of brokenness it is considered that a review of a subject 41 times as opposed to 40 times is meritorious. What happened, why the drop-off? For many centuries, the Jews refrained from setting down their teachings on parchment because of the dangers of learning without a teacher. Books have a way of containing information that can get misinterpreted. With an actual teacher in front of a student, the student can relay what he has been taught back to the teacher and the teacher can correct any misinterpretation. Learning from words alone prohibits monitoring a reader’s comprehension as he pours over the text. In ancient times, customary daily prayers were recited by heart, or a reader prayed aloud and the congregation responded to the blessings with ‘Amein.’ There were no books containing the texts of the prayers. It was said, “The writers of blessings are like those who burn the Torah.” (Tosef. To Shab. 13:4). Writing down the text of blessings was considered forbidden. Today, our capacity for great mental recollection suffers with such a heavy reliance on the written word. Ask yourself, next time you are about to write down a phone number or an address, are you writing it down so you’ll remember it or are you writing it down so you don’t have to remember it? If we don’t use it, we lose it! In this walk memory is everything. “You will have these tassels to look at and so you will remember all the commands of Yahweh, that you may obey them and not prostitute yourselves by chasing after the lusts of your own hearts and eyes. Then you will remember to obey all my commands and will be consecrated to your Elohim. (Numbers 15:39-40)” The act of teshuvah (returning) comes by way of memory recall. One of the chief ways to improve memory is regular study and review of the text or words of a lecture you’re attending. “Be diligent to present yourself approved to Elohim as a workman who does not need to be ashamed, accurately dividing the word of truth. (2 Timothy 2:15)” The Jews hold great emphasis on regular study and review. Sanhedrin 99a Rabbi Yehoshua ben Korcha says, ‘Whoever studies Torah and then forgets what he learned resembles a woman who gives birth and then buries her child’. So if written material that pertains to the Torah (other than the written Torah) itself was forbidden, why is it accepted now and should we be throwing out all our written commentaries, teachings, notes and siddurim based of this? At the commencement of the Babylonian exile it became very apparent that vast amount of Torah knowledge might be lost due to the passing of so many wise Torah scholars. As a consequence, many teaching began to be documented in written form. After all, a written direction that might be misinterpreted or executed wrongly is better than no written direction at all. The written word, whether in the form of a letter or a specific subject or series of subjects, began to fill the void left by the deliberate removal of so many Torah scholars during exile. So the answer is a resounding ‘NO!’ don’t throw out any commentaries or teachings. Rather, you should get someone to take you through any text that purports to shed light on the Torah wherever possible (especially for a beginner). Even the very words of Scripture itself scream out for a guide. Rabbi Amram ben Sheshna haGaon, the leader of the Talmudic Academy at Sura in Babylon, wrote the first Siddur in about 875CE. This Siddur was written especially for scholars. One of his successors, the famous Saadia Gaon, compiled a siddur for general use in 882-942CE. During the Middle Ages prayer books grew longer and longer, as Jews wanted to spend more time in prayer. New supplications, new penitential prayers, new poems on a variety of religious themes were all added. No rabbinical synod met to vote on which prayers should or should not be included. Individuals made content selections in a very informal manner. Before 1446 all prayer books were written by hand. With handwriting came minor changes and errors, which confused the original text. The first printed prayer books appeared in the early 1500s, but since their type was set by hand, the errors multiplied. A German Jewish scholar, Seligman Baer, printed a definitive siddur in 1886, after he had carefully traced all sources and compared all manuscript versions available. This text is used in all recently published traditional Siddurim. As some Jews in the 16th century lost the skills in Hebrew that their ancestors had possessed, translations became necessary. Every Nazarene Israelite should own a siddur. There are many to choose from. Choose the one that best suits you. The next subject to tackle is how one uses the siddur. The best advice is to ‘aim small and miss small.’ The place to start is with the Shema our declaration of faith. The Shema is the central prayer in the Jewish prayer book. It is generally one of the first prayers a Jewish child learns. The Shema defines what it means to be Jewish as it has since the days of Moshe: Shema Yisrael Yahweh Eloheinu Yahweh Echad—“Hear, O Israel: Yahweh our Elohim, Yahweh is one” (Deuteronomy 6:4). The Scripture declares emphatically that “there is no Elohim besides (Yahweh)” (Deuteronomy 32:39), “I am Yahweh and there is no other” (Isaiah 45:18), together with similarly strong declarations in Isaiah 43:10, Isaiah 46:10, Exodus 3:14, and elsewhere. The Shema is the central creed of Israel and it serves as a focal point of Yahweh’s unified oneness. Sha’ul attests to this oneness. The Hebrew people have clung to this simple, central creed, which is personified in the story about a second-century Jewish martyr. His name was Rabbi Akiva, and he may be familiar to you because he hailed Simon Bar Kokhba as the Messiah in the second Jewish revolt which ended in disaster in 135CE. After the failed revolution of the Jews against Rome, the policy was set that the Torah (the Law) could no longer be taught on pain of death. Rabbi Akiva loved Yahweh so much that he taught Torah despite the Roman law forbidding it. When the Romans found out, they sentenced him to a painful death. They took a large iron comb and began to scrape off his 90-year-old flesh. When Rufus condemned the venerable Akiva to the hand of the executioner, it was just the time of day to recite the Shema. Full of devotion, Akiva recited his prayers calmly, though suffering agonies; and when Rufus asked him whether he was a sorcerer, since he felt no pain, Akiva replied, "I am no sorcerer; but I rejoice at the opportunity now given to me to love my Elohim 'with all my life,' seeing that I have hitherto been able to love Him only 'with all my means' and 'with all my might,'" and with the word 'One!' he expired" (Yer. Ber. ix. 14b, and somewhat modified in Bab. 61b). Akiva wanted to be able to love Yahweh with everything, which included the idea of loving Yahweh to the point of pouring out his soul to death. Torah is the SHEMA and the second greatest commandment is to love your neighbour as yourself. Now, we’ve established where to start, how do we learn it? In English? No, you know it in English already. We learn it in Hebrew. Join with me now as we close the lesson today in a short video on learning the Shema in Hebrew.